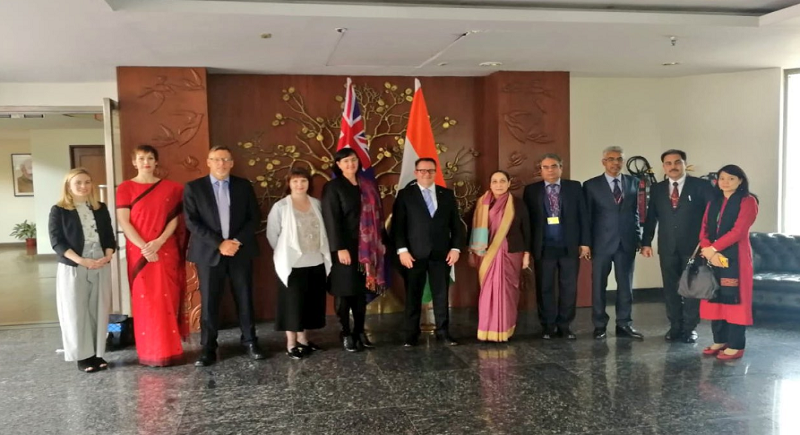 New Delhi, February 7: The Second Foreign Office Consultations between India and New Zealand provided an opportunity to review the entire range of bilateral relations, including political, trade and economic ties. India reaffirmed its commitment to working closely with New Zealand in these areas. The two sides also exchanged views on regional and multilateral issues, including cooperation at UN and other International Organizations. The Second Foreign Office Consultations between India and New Zealand was held on 05 February 2019 in New Delhi. The countries set up a Joint Trade Committee in 1983 and have had discussions on a free trade agreement either bilaterally or through the East Asian Summit, but this has not emerged due to disagreements over agricultural subsidies. There is also some educational cooperation, with around 23,000 Indian students studying in New Zealand. On 27 November 2017, the first India-New Zealand Cyber Dialogue was held in New Delhi. Defense cooperation has been more limited, but there have been joint naval exercises, and Indian and New Zealand troops have served together in United Nations peacekeeping missions in Kosovo and Sudan. Pranab Mukherjee became the first Indian President to visit New Zealand in August 2016. The New Zealand India Research Institute is a result of the increasing co-operation. Based at Victoria University in Wellington it will involve nearly 40 academics in five New Zealand universities – Victoria, Auckland, Massey, Canterbury and Otago - in research on India and NZ-India relations.